You can Download this instalment’s ZIP file here. At the end of the previous instalment I set two challenges, a quick and easy one, and, a much more challenging one. Let’s start with the easy one. The first challenge was simply to add a dismissible alert to the recipe you’ve been working on for the past few challenges. For completeness I’ve included my full sample solution in the folder pbs60-challenge1-solution in this instalment’s ZIP. The second challenge was a little more complex, but basically involved extending the example file pbs60b.html from the previous instalment. The example was a page with a button to add alerts, and one to dismiss all the alerts. The challenge was to create a similar page, but to allow the user to specify the text and style for the alerts. Notice the proper use of labels and ARIA attributes to make the form accessible. Most of this code is very similar to that in pbs60b.html, but the two notable differences are where the code extracts the values from the text box and dropdown. $('#alert_text_tb').val() || "A sample Alert — enter text in the textbox!" Remember, when you pass jQuery a CSS selector as a single string argument is searches the entire document for elements matching that selector. In this case that would be exactly one thing, the text box with the ID alert_text_tb. I then call jQuery’s .val() function on that text box to get at the value. If there is no value, I default to the string "A sample Alert — enter text in the textbox!". This is very similar in that it uses jQuery to get the dropdown by ID and then get its value, but this time there’s no need for a default since there is always something selected in the dropdown. Notice the use of ES6 template strings to inject the value into a larger string. Many websites today have a large show-case area at the top of their front page that shouts out the site’s main message, and usually has one or more calls to action. It could be the name of the company, their motto or catchphrase, and a call to sign up now. We could mark that up with basic Bootstrap as a display heading, a lead paragraph, and a regular paragraph, and a button, but it wouldn’t really catch the eye as desired. That’s the problem the so-called Jumbotron component is designed to solve. 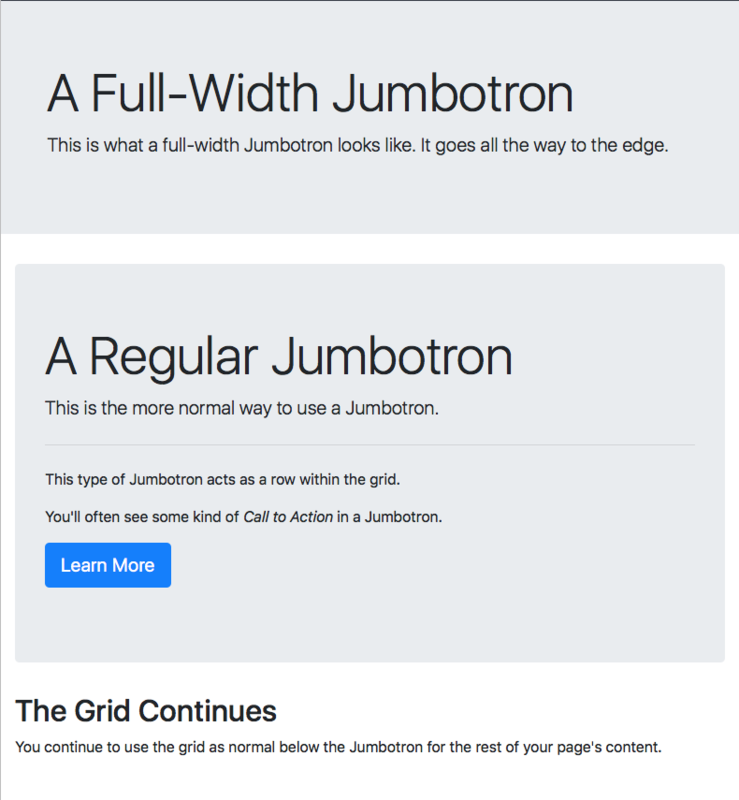 The Jumbotron comes in two flavours, one designed to replace a row in a Bootstrap layout, and the other to act as an edge-to-edge header outside the grid. To use the more common form simply replace the relevant row in your grid with an element with the class jumbotron, and add your content directly into it. To use the edge-to-edge form you effectively reverse the process, you add a top-level element and give it the classes jumbotron and jumbotron-fluid, and then add an element directly within it with the class container. Contrary to how containers normally work, within a jumbotron you can choose not to add rows or columns and add your content directly into the container. The key points to note are that the Jumbotron is outside the container, and the Jumbotron’s content is directly contained within the container which is directly contained within the Jumbotron. This one of the few exceptions where a Bootstrap container doesn’t contain rows which contains columns. The key point to note is that this form of Jumbotron sits within the regular grid, acting as special row. Also, note the little sneak-peek at the power of Bootstrap’s btn classes, they do more than just style buttons, they can also turn links into buttons! Something else you see all over the web are badges, little bubbles next to titles or within buttons with extra information. This is often simply a number, but sometimes a word like New or a short phrase like Best Value. Bootstrap’s badge component gives you a really quick and easy way if adding these little pieces of metadata. You simply wrap the piece of text inside an inline element (usually a <span>) and give it the classes badge and one of badge-primary, badge-secondary, badge-info, badge-success, badge-warning, badge-danger, badge-light, or badge-dark. 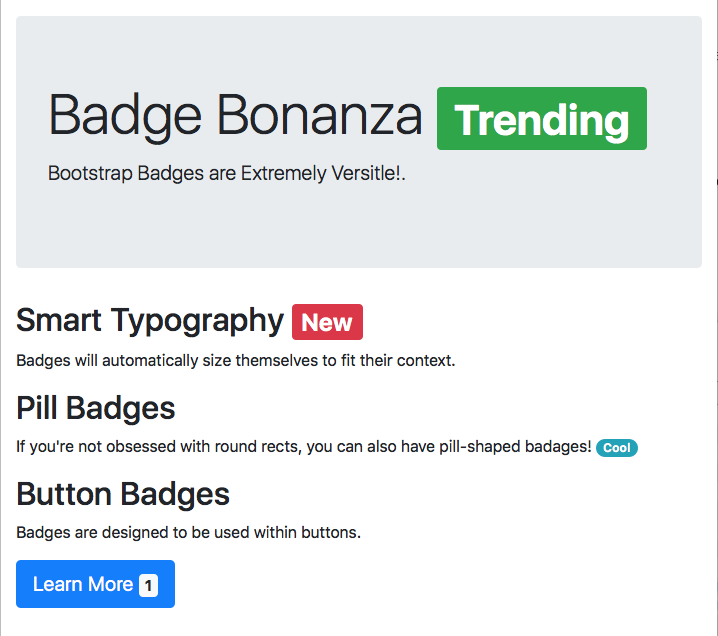 By default badges are displayed as rounded rectangles, but if you prefer pill-shaped badges just add the class badge-pill. If you want to make actionable badges then add the badge classes directly to an <a> tag and you’ll get subtle but nice hover behaviour. Replace the heading of the recipe you’ve been working on for recent challenges with a Jumbotron. Use whichever flavour you prefer. Update either your solution to the previous challenge, or my sample solution, so that the button to generate alerts contains a badge showing the number of alerts currently open. You’ll need to write event listeners to update the contents of the badge.